Click above for details about these and many more dessert cookbooks! Desserts are fun to create, to cook, and to eat. There may be a lot of noble art in cooking a swan, but it is never as pretty or delectible as a mound of spun sugar on a high chocolate mousse tart. Here are some really good recipes, and we will be continuously adding to this part of the site. Soon it is the time for pies made with real mince meat, especially venison, and lots of fruit goodies. 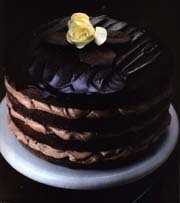 We also will soon put up a triple chocolate tower cake. On a personal level, in addition to my career as a chef I am a silversmith in the Southwestern tradition. If you like nice sterling silver work with Turquoise, Lapis Lazuli and such, please visit my jewelry website by Clicking Here. Return here by using your computer's "Back" button. Also, a word about our sponsors. Your tremendous response to this site has allowed us to obtain many sponsors with worthwhile websites. We have chosen sites that we believe will be of interest to many of you. This website takes a lot of maintainance, we answer a ton of email and we continuously add recipes for your benefit. Our compensation for this website comes only when you click on our sponsors' banners. We would greatly appreciate your clicking any banner that interests you. Return here with your "back" button after you have finished "looking around", and thank you. Bookmark this site or add it to your favorites list now. Come back often to see what's cooking. I would appreciate feedback, especially as to anything you may find confusing or hard to understand in the recipes. Keep in touch, and... KEEP ON COOKIN'! Singles Dating for Free - Wine & Dine Singles in Your Area.